if I cannot place at all, I shall still do my best. I’ve done it. After years of just dreaming about running the magic 42.5 km, I finally did it. Yes, at long last, after months of training—inconsistent I might have been—I have finished my first marathon! It was far from ideal; instead of finishing in 4 hrs 45 min as I had targeted, I reached the finish line almost an hour later (5 hrs 32 min). But, I am still standing, relatively injury free, and raring to run again. 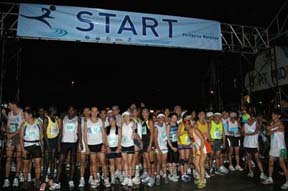 Days before the Pasig marathon on February 24 I had serious doubts whether I would finish. I had stopped my training two weeks before due to colds and hard cough. Every time I woke up to run, my body just would not cooperate. I felt sluggish and tired. I knew that those were symptoms of overtraining, so I opted to rest, knowing that if I did run and made my illness worse, all the training that I had done in the past few months would get me nowhere near the starting line. After a week, my cough worsened, so I took antibiotics. I carboloaded as well, eating rice or pasta every meal. By Saturday afternoon, although I felt much better, I could not keep still. I was wired, I told my friends. I was restless, and it wasn’t until I decided to run an easy 7.5 km that my anxiety lessened a bit. I was slower than usual, but the nervous energy which had me pacing the whole day was expended. I slept at 11, woke up at 1am and had breakfast. By 3am on Sunday, my friends and I were on our way to Marikina, wearing the singlet that I absolutely loved at sight. I couldn’t explain my feeling seeing all those runners in the Amphitheater. This is it, I thought. Months of training had brought me to this site. Here, there were no 5k or 10k racers. All of us were in for the marathon. There were hundreds of men while there were only a handful of women. Queuing to be checked in, we were chatted by a veteran, who said that it was his fourth marathon. He was full of tips, nothing we haven’t heard already, but it was nice just the same. There was an unexplainable feeling in the air. Excitement, yes, but it was also more than that. We were all there, people of all sizes and shapes and ages, waiting to run, not against each other, but against ourselves. It was a heady feeling. I felt well enough at the start of the run. A retired general kept pace with us along Libis, and when my friend stopped to pee at a gas station, he stayed behind to wait for her. I told him that I could not wait for her. She could catch up to me, but if I waited, I would not be able to regain my momentum. A few minutes after I ran alone, Joseph from the Special Action Forces kept pace with me. 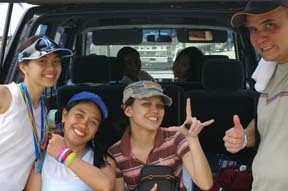 He said that they had run in Subic and liked the route there. I let him talk, glad for the company. We ran together from Ortigas, all the way through C5 and up to Bayani Road. I felt fine, and looking at my Timex, I knew that I had kept the pace I set. However, trouble started at km 20. I didn’t notice that throughout C5 I had been running in the rightmost side of the road where the pavement was uneven. (I learned later that it’s called a crowned surface, and one of the common causes of knee pain.) I only noticed when my right knee felt it, but by then it was too late. The outer part of my right knee started to hurt and only felt bearable when I slowed down considerably. Joseph kept slowing down as well to pace with me, saying it was okay, until I told him, firmly, that he should go ahead. I knew I could have pushed myself more. I could have ignored the pain and to hell with the consequences later. However, I also knew that if I pushed too hard, I would risk a more serious injury, and I might not be able to run another marathon again. So I deliberately ran very slowly, taking it easy. Runner after runner passed me by, but all I thought was that it was only my first marathon. My body’s condition after that would determine whether I would run another one again, and I desperately wanted to continue running this distance. From km 20 onwards, I didn’t have a constant running buddy anymore. The back-of-the- packers, like me, were mostly those with injuries. I remember this runner, whom I paced with along the blasted flyovers in Laura, saying that if he didn’t see so many volunteers and marshals, he would have hailed a jeepney and rode part of the way to the finish. I pointed out that there were ambulances if he could not bear his injured knee anymore, but it seemed that he too, didn’t want to have a DNF that day. Another runner, seeing me walk up the damned flyover, told me to run slowly. Never walk, he said, because it only makes the pain worse. I took his advice, and eventually overtook him walking along P. Casal St.! (What I really liked about the route was the number of people who watched us pass by. One group asked me whether it was for military training, and another asked if it was a race. I grinned when I heard a woman ask her companion incredulously, Galing pa sila ng Marikina? Ang layo nun a! A small girl, seeing me, exclaimed, Aba, pati babae pala sumasali din! Other children and even adults along the way shouted encouragement as well, saying Kayang-kaya mo yan!). Despite my weakened knee, though, I never experienced the wall. I was going so slowly that my glycogen stores were far from depleted. My spirits remained up, and I felt that I could go on and on. When I saw the Manila Hotel, I could feel strength pouring in my body, and I sprinted towards the finish, not feeling pain at all, buoyed by my friends’ cheers, and the cheers of other runners who finished ahead of me. I wish I could have preserved that moment forever! After I crossed the finish line, I walked around a bit, claimed my freebies, and sat down the pavement to ice my legs. While waiting for our other friend to finish, we took pictures, ate chocolates and bananas, drank Gatorade and water, and cheered for those who limped, walked, and staggered to the finish line. We saw the old general and enthusiastically shook his hand. We cheered for the last woman runner who staggered in, limping and crying as she crossed the finish. 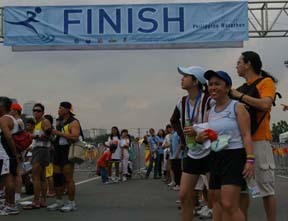 Did she cry because of pain, or because she finished at last despite her injuries? I would rather think it was the latter. We had our pictures taken on the stage, wearing the finisher’s medal. 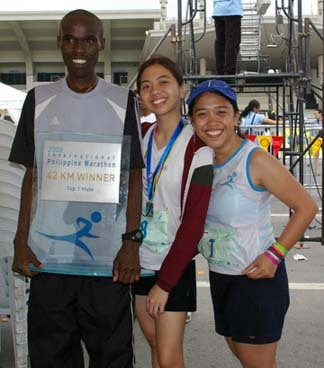 We posed beside the Kenyans, grinning ear-to-ear, proud to be beside these people whose speed we could only dream about. Two days after the marathon, all that remained of my adventure was a slight stiffness of my thighs whenever I bend down. My knees were fine, and I did not even have the dead toenails or blisters that most runners obtained after a long run. I felt wonderful, and the marathon seemed like a hundred years ago. Truthfully, I could not begin training for my next one, though I know that I need at least a month for my muscles to completely recover. So, yes, I think that despite my “not so good” finish, I made a good decision to under-perform. I am in peak condition, and my desire to run more marathons, instead of being quenched, is now stronger than ever. To Joseph, and to the general, the-runner-who-wanted-to-ride-a- jeep, and all those whom I’ve run and walked with along the way to the finish, may we cross paths again soon! With my running buddies and the support team. Thanks so much! nice story… one that only a runner with enough passion for the sport can write. but more than that, i would say a good run for a newbie marathoner. you’re lucky to have those buddies with you. i finished my first 42k practically alone after the first 5k. :)<BR/><BR/>congratulations, keli… keep on running!